Advanced internet search lesson continued. - Complete 10 more note cards from your database articles. For a total of 30 notecards. Those students who will be on the filed trip should do 20 more for a total of 40. - Add your outline under Notecards in NoodleTools. Due Tuesday 12:01 am. Past due. 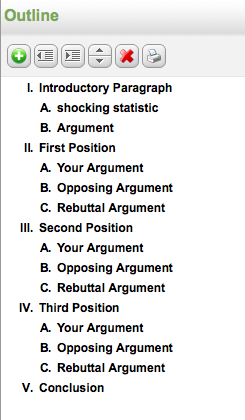 Sample Outline: Your outline must be more specific for each main position II-IV. Argument - Laws restricting guns need to be strengthened. First Position = Laws need to be strengthened limiting access to assault rifles. Second Position = Anyone being a gun anywhere must have a background check.